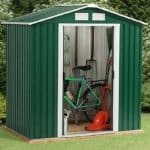 This large garden shed stands at 9.9 x 7.7. 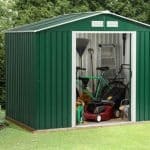 The metal shed has an apex roof, which immediately brings you more scope for tall shelving and storage of taller equipment. 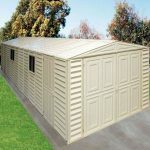 It is built in hot dipped galvanised steel, so you have a shed that is very durable and also very resistant to rust and other damage. 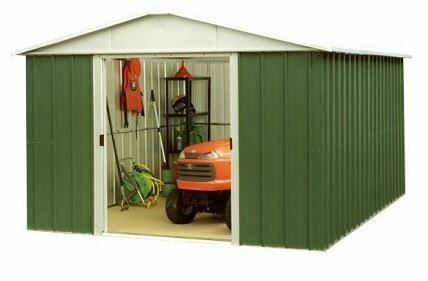 The shed is also rodent and rot proof. 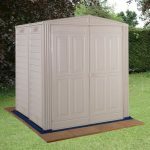 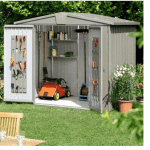 To add even more value, the shed comes with a free anchor fitting so that your shed can be anchored to the ground and therefore be more stable. 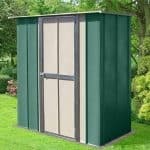 A 10 year anti-rust guarantee is supplied.